Suddenly you’re thirsty all of the time. Or maybe you can’t seem to get enough sleep. You might be going to the bathroom much more than usual. Or perhaps you’ve lost weight without trying. With any or all of these symptoms, you could be experiencing the early warning signs of diabetes, joining almost 250 million people worldwide who have the disease. But you don’t have to become a statistic. And sometimes people don’t even know they are part of the stats: one third of those people don’t know that they have the condition, and forty-six percent of them are between 40 and 59 years old. Diabetes, or complications from the disease, now kills 3.8 million people a year, or about the same number as HIV/AIDS. 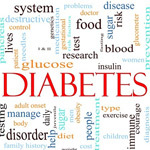 The International Diabetes Federation calls the disease the epidemic of the 21st century. Only 20 years ago the numbers were much lower: 30 million people around the world had the disease. The federation expects that by 2025 the number of people living with diabetes will hit 380 million. The problems behind the numbers are even more alarming. Diabetes is the leading cause of blindness and kidney failure among adults. It causes mild to severe nerve damage that, coupled with diabetes-related circulation problems, often leads to the loss of a leg or foot. Diabetes also significantly increases the risk of heart disease. Type 1 diabetes occurs when the immune system attacks and permanently disables the insulin-making cells in the pancreas. This type, once called juvenile-onset or insulin-dependent diabetes, affects about one million Americans. The other form, type 2 (once called adult-onset diabetes), takes years to develop into full-blown diabetes. It begins when muscle and other cells stop responding to insulin's open-up-for-glucose signal. The body responds by making more insulin and the insulin-making cells eventually get exhausted and begin to fail. But, realistically, no one has to jump on the type 2 diabetic insulin train. Diabetes prevention is proven, possible, and powerful. Making a few changes can dramatically lower the chances of developing type 2 diabetes. The same changes can also lower the chances of developing heart disease and some cancers. The key to preventing type 2 diabetes can be simplified: Get active and get lean. Control your weight. Being overweight increases the chances of developing type 2 diabetes seven-fold and is the single most important cause of this type of diabetes. About 80 percent of people with type 2 diabetes are overweight. Being obese makes you 20 to 40 times more likely to develop diabetes than someone with a healthy weight. Losing 7-10% of your current weight (if it is above the healthy-weight range) can cut your chances of developing type 2 diabetes in half. Get moving. Working your muscles more often and making them work harder improves their ability to use insulin and absorb glucose. This puts less stress on your insulin-making cells. Studies suggest that walking briskly for a half hour every day reduces the risk of developing type 2 diabetes by 30%. Two dietary changes can have a big impact on the risk of type 2 diabetes. Choose whole grains and whole-grain products over highly processed carbohydrates. Carbohydrates that aren't as easily digested cause lower and slower increases in blood sugar and insulin. Examples of the carbs to choose include whole wheat, brown rice, other whole grains, most beans and nuts, and whole grain breakfast cereals. Choose good fats instead of bad fats. People with diabetes are at increased risk for heart disease. Eating a diet low in saturated fat can reduce the risk. Good fats, such as the polyunsaturated fats found in tuna, salmon, liquid vegetable oils, and many nuts, can help reduce the risk of heart disease. Trans fats do just the opposite. These bad fats are found in many margarines, packaged baked goods, fried foods in most fast-food restaurants, and any product that lists "partially hydrogenated vegetable oil" on the label. Quit Smoking. Smokers are 50% to 90% more likely to develop diabetes than nonsmokers, so add type 2 diabetes to the long list of health problems linked with smoking.